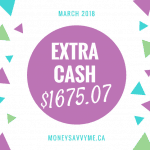 November’s always a nice cashback month for me since that’s when my I get my annual cashback deposit from my Scotiabank Momentum Visa! I usually also do a big Shoppers Redemption in November, but since my stock pile is pretty well stocked, I decided to hold off and save the points to use towards groceries when Optimum and PC Plus merge in February. So with my Momentum cashback, I was able to bring in an extra $1453.80 in November!